 If D'Aveni were not a professor at Dartmouth's Amos Tuck School, one could easily imagine that his grandiloquent management guide was meant to be an absurdist spoof of a publishing subgenre not especially teeming with useful or readable works. Drawing almost wholly on secondary sources, however, the deadly earnest author has cobbled together a repetitious handbook that combines a fevered appraisal of a new menace supposedly convulsing the global marketplace with programmatic recommendations for combating it. 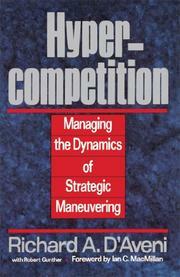 According to D'Aveni, the present danger is hypercompetition, a notably merciless form of commercial conflict that can be conducted in a host of ways. By the author's account, preternaturally aggressive enterprises may seek to erode, neutralize, or (more likely) obliterate the comparative advantages of their rivals in areas such as market access, cost, know-how, quality, resources, and timing. Moving on from his anecdotal audit of the no-quarter games cutthroat companies play, D'Aveni identifies the distinguishing characteristics of hypercompetition. He then segues into another by-the-numbers exercise known as the New 7-S's, the collective designation for a series of interactive initiatives that may be employed to sustain momentum (rather than equilibrium) in operating environments subject to sudden change. Similar cases in point range from ensuring superior stakeholder satisfaction and strategic soothsaying through simultaneous and sequential strategic thrusts. Offered as well are tedious takes on such techniques as escalation-ladder analysis and price-quality mapping. Even after allowing for the transforming aspects of advanced technologies, D'Aveni's big-picture perspectives and addled advisories could strike most corporate executives as the virtual realities of an academic theorist convinced he can impose order on a perdurably adversarial business world. The jargon-marred text has tabular material throughout.